NOTE: MINIMUM TWO NIGHT STAY ON WEEKENDS. At an altitude of 880 meters your cabin has spectacular views of Melbourne skyline, Port Phillip Bay, the You Yangs and beyond. Set on 25 acres, you are welcome to explore the property and the gardens. 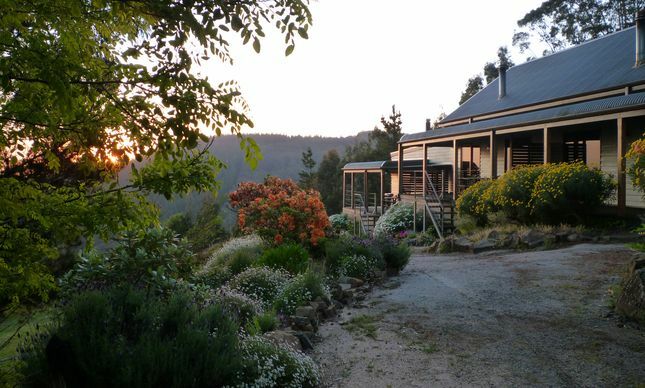 The property is surrounded by the Macedon State Forest providing seclusion and tranquility. Own outdoor deck area with outdoor table and chairs. Bedroom alcove with queen bed, electric blankets, side reading lamps, wardrobe. All linen is supplied. Ammenities include soap, shampoo, conditioner, hand wash, hand cream. Lounge/dining area has 3 seater couch, wood fire, dining table. TV DVD. Games and puzzles and DVD library. Fully self contained kitchen with two burner electric cooktop, fridge, microwave,electric frypan and all utensils. Ammenities include: coffe, plunger coffee, tea, sugar, salt pepper and biscuits. Ensuite bathroom has two-person spa, shower, vanity, toilet, heated towel rails. Other heating/cooling: Reverse cycle air conditioning. Ceiling fan. ONE NIGHT STAYS ARE ONLY AVAILABLE FROM MONDAY TO THURSDAY. Refer to owner if you are looking for a one night stay. If you feel like spoiling yourself you may consider upgrading to our luxury retreat called 'Eagles Nest' . Eagles Nest is in the same location but is our corner cabin boasting wider views and bigger living space. For more information visit Cherokee Mountain Retreat- Eagles Nest. LOCATION AND WHAT TO DO. 35 minutes from Tullamarine airport. Saturdays, Buy fresh produce at one of the local farmers markets. Bring your bike and ride the hills. Snuggle up under the luxurious doona in your queen size bed. FOR COUPLES ONLY. SORRY NO CHILDREN. NO PETS. One night stay available mid week. Refer to owner. Providing the property is successfully re-let, the initial guests deposit will be issued as as a voucher to use another time. All cancellations must be received in writing (email or text) and must subsequently have been confirmed by us as having been received. 2. If we are able to let the retreat to another guest for the dates you cancelled you will be issued a voucher to use at another time. (Constitutes any time less than 10 x days prior to check in) are not refundable. We will always do our best to find another guest to fill your spot and if we are able to do so in this case we will issue you a voucher less $50 administration fee for you to use another time. Your cabin is set on side of mountain at 880 meters in the Macedon Ranges. Secluded with sensational views toward Melbourne/ Port Phillip Bay the You Yang mountain range. We had a very enjoyable stay in The Gums. The accomodation was perfect , the surrounds were beautiful & the views breathtaking. . Suzanne is the perfect host with information about the local area. She has thought of & provided everything you may need for your stay , binoculars , seed for the stunning wild birds & she even created the paintings on the walls . I would thoroughly recommend staying here . Great view, beautiful room, very peaceful,,, Suzanne’s place is just perfect to be away from the busy life. One of my favourite places to go back definitely!! Perfect place to get away from it all.....very quiet location a hidden gem in the forest. Thank you Suzanne for making us feel very welcome. A very cosy cabin in the mountains surrounded by beautiful bush walks and wildlife. A great place for a relaxing get away relatively close to town. Historic Hanging Rock is 10 minutes from property.